Javier Jose Sierra has survived if not prospered for 45 years in a game he loves. Yet, he does not warrant a bio in any media guide. He is racing’s Invisible Man. The 66-year-old trainer has been sedulously plying his trade despite lack of recognition, ego be damned. A native of El Paso, Sierra stands on a foundation adorned with pillars of self-confidence, gained in no small part from a proper upbringing in a family of 12 children, and tours early on with legendary trainers D. Wayne Lukas and J.J. Pletcher, father of Todd Pletcher. Sierra grew up in Juarez where he played soccer as a kid. At 14 he aspired to be a jockey at Sunland Park in New Mexico, but his father, Cirilo, a native of Mexico, made education a priority. Javier aborted racing, went to school at the University of Texas El Paso (UTEP) and graduated with a degree in electrical engineering. Eventually, he earned an MBA while still working full time. The appeal of the turf, however, proved an alluring temptress. Duly smitten, Sierra ultimately came to California in 1976. Most of Javier’s family were involved in racing. “All my brothers worked in racing in different positions, grooms, hot walkers, exercise riders, thanks to my father, who was a trainer. “While in college, I worked three summers for Lukas when he trained quarter horses in New Mexico, and with J.J. Pletcher one year at Sunland Park. I remember Todd being there. He was probably five years old. “I learned a lot from both men, especially Pletcher. I was impressed with the quality of horses he brought in from back east. One was a son of Bold Ruler named First Edition. J.J.’s training regimen was amazing, completely unlike everyone else there at the time. Bloss trained the great Gallant Man in the first part of his two-year-old season before he was transferred to New York with John Nerud. Gallant Man, along with Bold Ruler and Round Table, in 1957 comprised arguably the greatest crop of three-year-olds ever. Gallant Man finished second by a nose to Iron Liege and Bill Hartack in that year’s Run for the Roses when Bill Shoemaker, aboard Gallant Man, misjudged the finish line and stood up in the stirrups in the shadow of the wire. Gallant Man went on to win the Belmont Stakes and at age 34, became the longest living horse to win a Triple Crown race. He died on Sept. 7, 1988. Count Fleet was the previous record holder, having died on Nov. 30, 1987 at the age of 33 years, eight months. 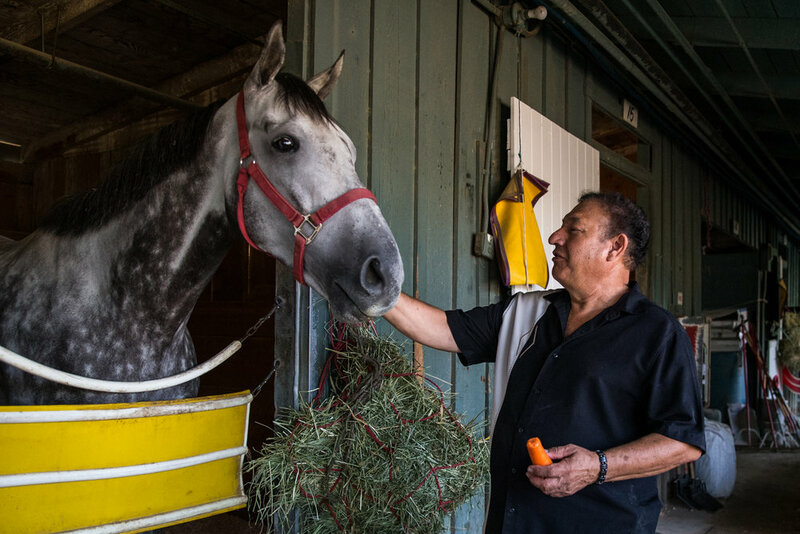 All these years later, he is a mainstay in the Golden State, making Santa Anita his headquarters save for tours at Del Mar when the seaside track is open. He lives 17 miles from Santa Anita in La Crescenta, with his wife, Dulce. He has never raced on the East Coast.